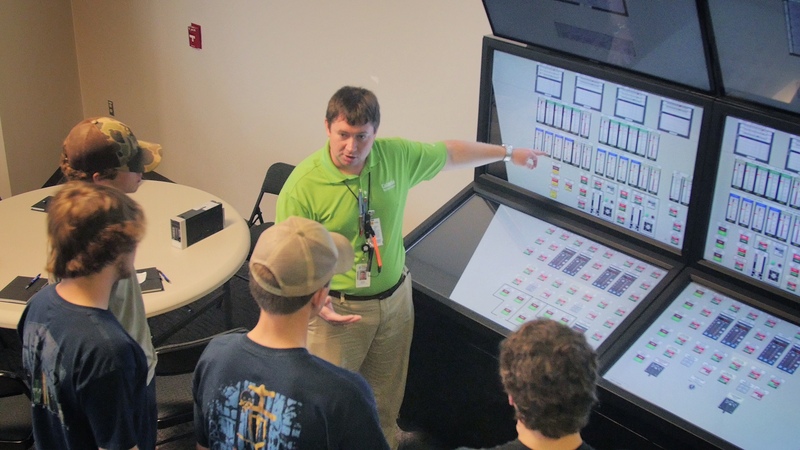 Last year, when a local Clover, S.C., high school parent asked the Catawba Nuclear Station vice president if the station offered a high school internship, he had no idea his question would lead to a career exploration day for his son and other students interested in nuclear. Area students learn about the control room on this glass top simulator. 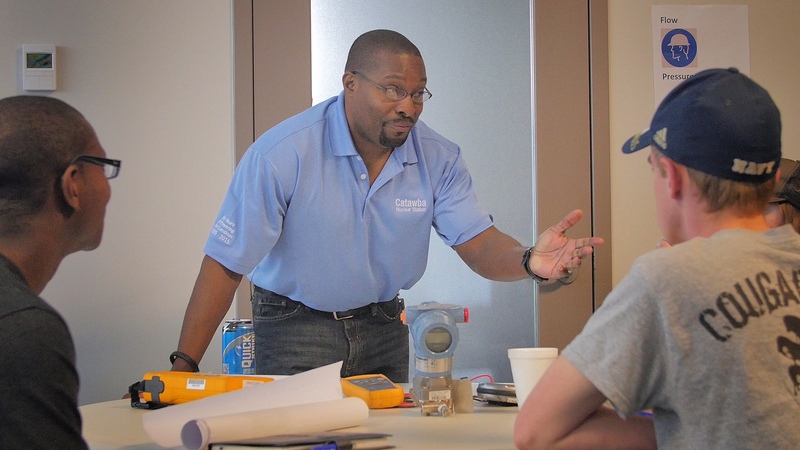 Duke Energy does offer summer internships … for college students. 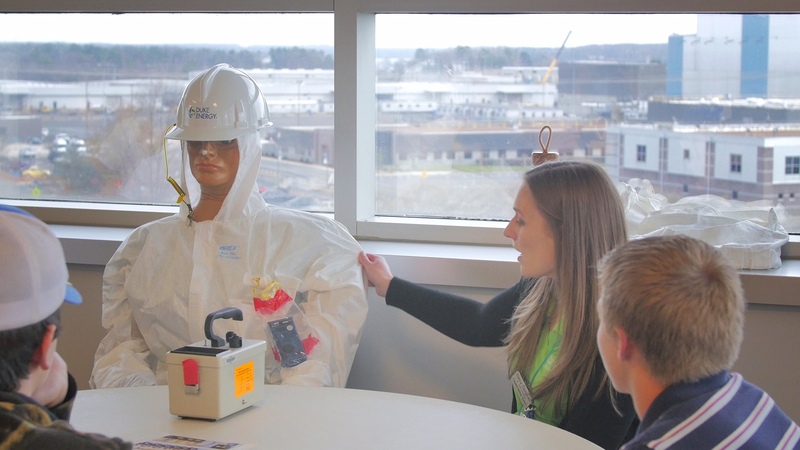 To bridge that gap, on March 11, 2016, employees at Catawba Nuclear Station hosted the first career exploration day for high school juniors and seniors from three local schools, as well as local homeschool students. This event connected students interested in STEM and nuclear careers with plant employees working in science and engineering fields. The event was set up speed-dating style, where students visited 12 career stations staffed by plant employees for 10 minutes each. School counselors and advisors at the schools handpicked the students that had previously expressed an interest in a STEM or nuclear career. Students learn about radiation protection at Catawba’s Career Exploration Day. “The message was ‘spot on’ regarding preparation, education and job roles,” said one school administrator. Plant employees volunteered to staff the 12 career stations. The careers explored were nuclear engineering, civil engineering, radiation protection, environmental science, finance, mechanical maintenance, instrumentation and controls maintenance, supply chain, chemistry and operations (with a tour of the station control room simulator). With a large percentage of the nuclear workforce set to retire in the next 5-10 years, getting high school students interested in STEM and nuclear careers is paramount. And, events like this are a step in the right direction. Catawba employees share their career experiences with local area students. So, what about that Clover parents’ son? He attended the event and now wants to study engineering at a local technical school.